There has been a growing awareness of the need for safe management of healthcare waste all over the world. Healthcare wastes which pose the greatest risk to human health are infectious waste (or biomedical waste) which constitutes 15 – 25 percent of total healthcare waste. 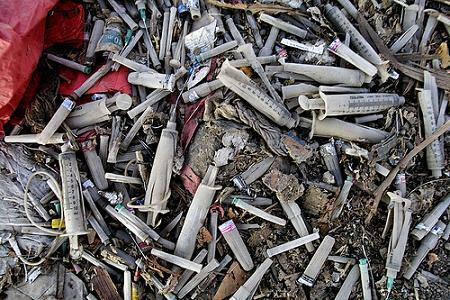 Infectious wastes may include all waste items that are contaminated with or suspected of being contaminated with body fluids such as blood and blood products, used catheters and gloves, cultures and stocks of infectious agents, wound dressings, nappies, discarded diagnostic samples, contaminated materials (swabs, bandages, and gauze), disposal medical devices such as sharps and syringes, contaminated laboratory animals etc. The quantity of waste produced in a hospital depends on the level of national income and the type of facility concerned. A university hospital in a high-income country can produce up to 10 kg of waste per bed per day, all categories combined. Improper management of healthcare wastes from hospitals, clinics and other facilities pose occupational and public health risks to patients, health workers, waste handlers, haulers and general public. It may also lead to contamination of air, water and soil which may affect all forms of life. In addition, if waste is not disposed of properly, members of the community may have an opportunity to collect disposable medical equipment (particularly syringes) and to resell these materials which may cause dangerous diseases. According to World Health Organization, hospital-associated infections (HAI) affect approximately 5% of hospitalized patients. The complexity of infectious healthcare waste problems and the recent rise in the incidence of diseases such as AIDS, SARS and Hepatitis B open up greater risk of contamination through mishandling and unsafe disposal practices. Inadequate waste management can cause environmental pollution, growth and multiplication of vectors like insects, rodents and worms and may lead to the transmission of diseases like typhoid, cholera, hepatitis and AIDS through injuries from syringes and needles contaminated with human. In addition to health risks associated with poor management of medical waste, consideration must also be given to the impact on environment, especially to the risks of pollution of water, air and soil in developing countries. Nowadays, modern technologies are available that can mitigate harmful impacts of healthcare wastes. The key technologies for medical waste treatment include steam sterilization, advanced steam sterilization, microwave treatment, dry heat sterilization, alkaline hydrolysis, biological treatment and plasma gasification.